Abigail roasted a joint of beef for the family dinner. Marc roasted the coffee beans ready for grinding. Veronica was roasting in the summer heat. The critics have roasted the director's latest movie. The host roasted the guest of honor in his after-dinner speech. There was a good crowd of people at the hog roast. Dan is making roast potatoes. In the US, a roast can also be a ceremonial dinner at which the guest of honor is good-naturedly mocked in the speeches. In both US and UK English, a roast, as mentioned above, is meat that has been roasted. However, in UK English, a roast can also be a roast dinner, that is, meat that has been roasted and all the vegetables that accompany it. In the UK roasts are traditionally eaten on Sundays (this is known as a Sunday roast), but most people don’t have a roast every Sunday anymore. A roast is also the traditional dinner on Christmas Day and most people in the UK still do follow this tradition (and so do people in the US, but they don’t call the whole dinner a roast). 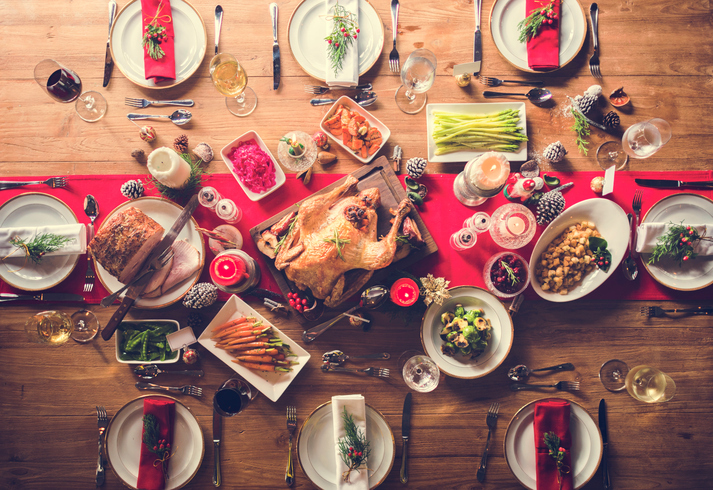 In the UK, Christmas dinner is normally roast turkey or goose, roast potatoes (potatoes cooked in fat or oil in the oven), and vegetables (especially Brussels sprouts). There may also be stuffing, a mixture of breadcrumbs, herbs, and various other ingredients that is cooked inside the bird, and Yorkshire puddings (a type of savory batter cake cooked in the oven). Vegetarians and vegans may prepare any special meal for Christmas dinner, but for those who want to have a traditional roast dinner without the meat, a nut roast is a popular choice. In the US, Christmas dinner is often a whole roast ham or a turkey, accompanied by stuffing (for turkey), and several side dishes. Every family has their own traditional sides, which can often include mashed potatoes, gravy and cranberry sauce. Roast, meaning ‘to cook using dry heat,’ dates back to the late 13th century. The Middle English verb rosten comes from the Old French rostir (rôtir in modern French), meaning ‘to roast or burn,’ but is of a Germanic origin. It came into French from the Frankish hraustjan (to cook on a grate or gridiron). It is related to the Old High German rosten, the German rösten and the Middle Dutch roosten (all meaning ‘to roast’), as well as Germanic words meaning ‘grate’ or ‘gridiron,’ such as the German Rost and the Middle Dutch roost. It is also related to the English word roster, which comes from a figurative sense of the Middle Dutch roost (the lines drawn on a sheet of paper to make a list look like a gridiron). The intransitive senses ‘to be very hot’ and ‘to be exposed to high heat’a appeared around the year 1300. The meaning ‘to make fun of in a good-natured way’ dates back to the early 18th century. The noun, meaning ‘roasted meat’ or ‘meat for roasting,’ comes from the verb, and dates back to the early 14th century. The sense ‘a roasting’ is from the late 16th century, while ‘a good natured bantering’ is from the mid-18th century.